Here are the greatest Star Wars toys that no one wants you to have. Ever since the first movie was released back in 1977 Star Wars toys have delighted children for generations. Twentieth Century Fox offered toy licensing rights to Mattel, Hasbro, and Mego, the biggest action-figure makers in the country and all of them turned down the opportunity to profit from a "space opera" by a little-known director with a cast of unknown actors. Boy, do they regret that decision. As wonderful as the Star Wars toy line is, however, every now and then a toy gets banned. Here are the most amazing ones you'll never own. In 1978 the Star Wars toy line was a success making Kenner over $100 million. In anticipation of Empire Strikes Back Kenner released a special limited-edition mail-in action figure of Boba Fett with a working spring loaded missile launcher. At the same time, the Battlestar Galactica television show - which George Lucas unsuccessfully tried to sue - spawned a popular toy line by Mattel. One of Battlestar Galactica's most popular toys was the Colonial Viper which featured launching missiles. After a tragic accident with a toy missile, Kenner stopped all orders of the toy and revamped their Boba Fett toy to have an immobile missile. Although Kenner denies the toy’s existence, to this day a few people got heir hands on the unmodified ones and they're worth a fortune. Kinder Surprise is an Italian chocolate egg that has a toy hidden inside a plastic container and is banned in the U.S. and other countries. The earliest sets were only sold in Germany and Italy, but now they're sold all over the world. The candy is popular and a hot collector's item by adults and children alike. In 2013, they released a limited edition Star Wars collection with ten toys; Jango Fett, Obi-Wan Kenobi, Yoda, Count Dooku, Padme Amidala, R2-D2, Jar Jar Binks, Darth Vader, Clone Trooper, and C-3PO. Although the candies have choking hazard warnings in several languages there have been two confirmed deaths caused by them. The UK Department of Trade and Industry said, "The child’s tragic death was caused by the ingestion of a small part of the egg’s contents. Many other products and toys with small parts are available in the marketplace. If we were to start banning every product that could be swallowed by a child, there would be very few toys left in the market”. On the other hand, the United States Federal Food, Drug, and Cosmetic Act bans the products saying "that a confectionery product with a non-nutritive object, partially or totally embedded within it, cannot be sold within the United States, unless the FDA issues a regulation that the non-nutritive object has functional value and is non-injurious to health" and the FDA says "The imbedded non-nutritive objects in these confectionery products may pose a public health risk as the consumer may unknowingly choke on the object”. The toy ban is serious business too. Over 60,000 Kinder Surprises are seized at American airports every year. In January 2011, U.S. Customs and Border Protection (CBP) threatened a Canadian guy with a $300 (Canadian dollars) fine for carrying one across the U.S. border into Minnesota. 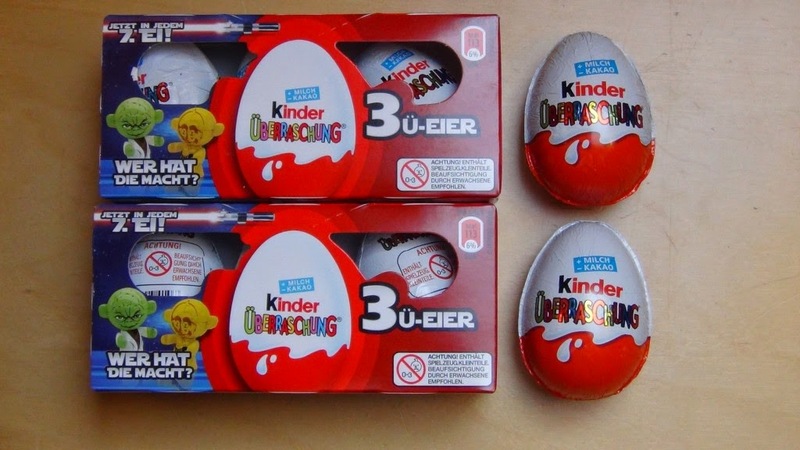 Again, in 2012, CBP held two Seattle men for two and a half hours after they found six Kinder Surprise eggs in their car returning from a Canada almost fine them US$2,500 per egg. While some, like Jennifer Ashton who’s daughter died from swallowing one of the parts, consider the toys dangerous, there is a vocal movement to have the ban on Kinder Surprise lifted. The toys are a beloved memory of from childhood all over the world especially England, Germany, China and Canada and they have fond memories of struggling with the egg, chipping teeth and almost choking on the parts. A year ago some activists started a “We the People” petition to get the White House to look into reversing its ban but, not unlike the request for a Federal Death Star program, didn’t get enough signatures. For now, the candy\toys are still banned, but a black market for Kinder Surprise is still going strong. While it's admirable that a store is trying to protect children one store went too far. Back in 1978, toy lightsabers were basically balloons with flashlights. Now they're very sophisticated. They're so realistic that a British Woolworths (remember them?) banned the sale of lightsaber toys to anyone over the age of 18. They reasoned that it's really hard to tell that the giant, glowing, green lightsaber isn't real and could be mistaken for a weapon. Star Wars toys are so popular that it's no wonder that other countries flooded the market with knock-off versions of the toys. Lucasfilm takes it very seriously and has aggressively pursued many illegal toy makers to protect their Intellectual Property. Howard Roffman, President of Lucas Licensing, which oversees the global Star Wars merchandise business said, "When companies...try to make a profit by confusing fans and flagrantly violating our trademark rights, we have to take action. We owe it to our fans – as well as to companies like Hasbro and Master Replicas, which are producing excellent authorized toy and replica lightsabers – to stop this type of unlawful behavior." Knock-offs can be big business and one guy was arrested for making ¥5 million (currently about US $46,765) selling bootleg One Piece figures online. None are rarer than the knock-offs from Poland known as "Uzay" figures. Besides being extremely shoddy they feature hilarious names, descriptions, and packaging that included gourds, calculators and bizarre themes. To us, the funniest is the cryptically named "Head Man." Is he named that because he's the head of something or just because he has a bizarre head? Is it the garbage can lid shield? We'll never know. What we do know is that he sells for $7,000. 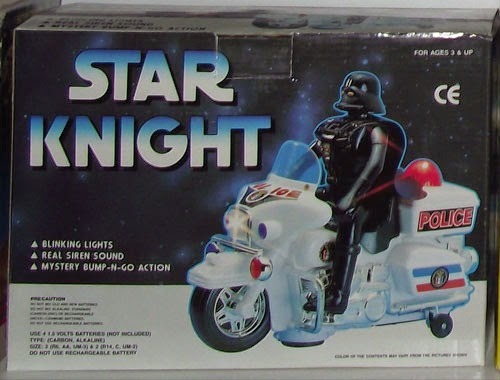 In the world of illegal bootleg Star Wars toys, one of the greatest is known as "Star Knight". It answers the common question: what would happen if Darth Vader became a policeman and rode a motorcycle? This 9-inch tall figure had Darth Vader riding a police motorcycle for some inexplicable reason. The motorcycle has bump-n-go action, lights, sounds, and a voice chip. When you turn it on the lights and sirens start and the cycle rolls forward. Then the motorcycle will stop, and Darth Vader will yell "HALT!" and then start shooting his machine guns. A more elegant weapon for a more civilized age. Who knew lightsabers could burn people? Back in 1999, Hasbro made a line of awesome toy lightsaber toys based on the Star Wars Episode I movie. They made a "Darth Maul Double-Bladed Lightsaber" that has two retractable red plastic "light blades" on both sides and a metallic-gray hand grip. The blades extended to a whopping 5 feet long. They also made a Qui-Gon Jinn Lightsaber which also has retractable green "light blade" that extended to about 3 feet. Both Lightsaber toys lit up when struck against anything and gave off a crashing sound. They also made a cool energy "humming," "charge-up" sounds just like the real thing. Unlike the real lightsabers (if there is such a thing) they ran off two “C” batteries. The CPSC told consumers to “stop using these Lightsabers immediately.” Why? It turned out there was a faulty spring in the toy. The spring in the battery compartment could dislodge causing the batteries to overheat or rupture. In fact, it did and burned a bunch of people. There were 38 reports of Lightsaber batteries overheating, including six reports of batteries rupturing. People complained about minor burns and eye irritation. Hasbro recalled around 618,000 Star Wars Lightsaber toys for repair and sent out kits to help fix it. The other option was to do what we did as kids: take a broom handle and make “whoo-whoo-whoo” noises while pretending to decapitate our friends. What was your favorite Star Wars toy? Which banned toy would you like to have? Anyone who thinks a light saber is a real weapon is in trouble. Those candies had a toy inside the candy itself? That does seem like a bad idea. HA! 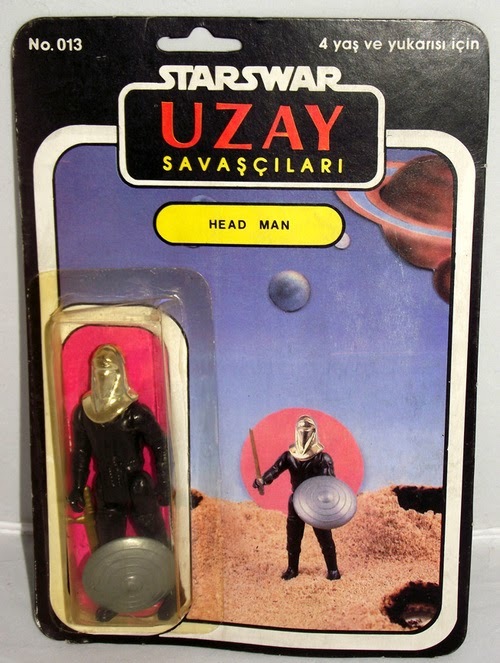 "Head Man" What a rare find! I remember sending off and getting the Emperor, but I never got the Boba Fett. Personally, I don't see why they banned Kinder Eggs. I followed the direction the package DO NOT GIVE TO CHILDREN 3 YEARS AND UNDER and I had no problems. Hell, a child can choke on a small lego but you don't see them banning them. YES! I had the Battle Star Galactica ships that shot those little red plastic missiles. A kid choked on one. You could go and mail your toy in and get a new one with the missiles glued inside the ships. That was no fun. And I also had one of those early lightsabers. The inflatable portion would light up, as it was connected to a flashlight, basically. We'd beat the living hell out of each other with them. I don't remember them being green. There were yellow-orange, I think. But my memory's faulty. I'm really pushing the envelope of British politeness by not making a big deal about Daleks not being robots. Vader on a police motorcycle is awesome. We really need a Star Wars/CHIPs crossover movie. Happy birthday Carrie Fisher, 58 today, but i`m obviously much more interested in her 18th birthday (40 years ago today) because thats when i would`ve loved to have buggered her senseless ! ! !. Another great idea Pat. Estrada wouldn’t have to wear makeup (ouch. too soon?). Star Knight. Classic. And I want that Uzay, darn it!